Have you ever heard of rope access? I bet you’ve seen it several times in your life. Did you know that you need to be certified before you can perform rope access work? Getting back to the real world now, what if you are an NDT inspector and hear about a job that pays a little more than normal, but requires rope access certification before you can get hired? Two of the organizations that provide qualification and certification guidance for this are SPRAT and IRATA. The North American society is called the Society of Professional Rope Access Technicians (SPRAT), and the International association is called the Industrial Rope Access Trade Association (IRATA International). In this article, we will limit our discussion to SPRAT, which is a non-profit organization. Why do these organizations exist? After all, NDT didn’t just randomly come into existence. NDT grew out of a need to improve safety and increase efficiencies. The American Society of Nondestructive Testing (ASNT) evolved to support the ever-changing NDT requirements. ASNT is also a non-profit organization. Their website can be found here: https://www.asnt.org/. On December 15, 1967, the Silver Bridge in West Virginia collapsed, killing 46 people. This led to the Federal Highway Act of 1968, which caused the Secretary of Transportation to create the National Bridge Inspection Standard. A current list of these standards can be found here: http://www.fhwa.dot.gov/bridge/nbis.cfm. You may have a dare-devil friend who fearlessly climbs to heights that would make you dizzy. Most of us, however, would prefer to use a safety device to ensure we go home in one piece. This is where rope access comes in. SPRAT, since the mid-1990’s, has developed a framework to make sure employers who require folks to work in dangerous locations do so safely and only do so after completing some training and examinations. Typical training for Levels I and II can be completed in a 5-day course, with the exams on the last day. Rope access certifications are in addition to your NDT certifications. They can be used together, but each certification is geared toward a specific skill set. You could be an NDT Level III with 20 years of experience, and you will still start at Level I with rope access because NDT doesn’t teach you the intricacies of using a rope to get to where you need to inspect. Experience can only be gained when you are performing work while on a rope, so certifications are sequential. Certification to Level I does not require any experience. You will complete the training and must pass both a written exam and a skills evaluation. This certification remains valid for 3 years. You must be certified before any experience hours are counted. Certification to Level II requires 500 hours and 6 months of experience as a Level I. Once again, you will be required to pass a written exam and a skills evaluation. This certification remains valid for 3 years. Certification to Level III requires 500 hours and 6 months of experience as a Level II. This means you will need a total of 1000 hours in order to qualify to Level III. As with the previous levels, there is a written exam and a skills evaluation. An additional requirement for Level III certification is a current CPR AED and First Aid Certification. This certification remains valid for 3 years. An obvious component of the skills evaluations is your ability to tie a variety of knots. Some of these are bowlines, Flemish Bends, and barrel knots. Remember, rope access, as it pertains to NDT, is about safely getting your body to a hard-to-reach location so you can perform an inspection. Once you master the knots and the basics of moving around on a rope, you will be ready to work as a Level I. Level II requirements go a little further. You will need to know how to place anchors, how to help another climber, how to slide, and how to rescue haul. As a Level III, you will have already mastered all of the previous requirements, so your focus will move to the bigger picture. You will be responsible for ensuring the safety of all rope access workers at a job site. So, what types of job sites require rope access certifications? The short answer is, any location that can’t be accessed with other technology. Offshore rigs use rope access extensively. Also, ropes are much less expensive than cranes and cherry pickers, so they can be tailored to specific on-shore locations. Let’s say you need to inspect a bridge. There will be locations on the sides of the bridge that you need to inspect. There might also be locations on the bottom side of the bridge that need to be inspected. Different techniques are required to access each of these areas. Rope access is not used solely for NDT. Other applications include, concrete repair, photography, cinematography, geological surveys, and pressure washing, to name a few. 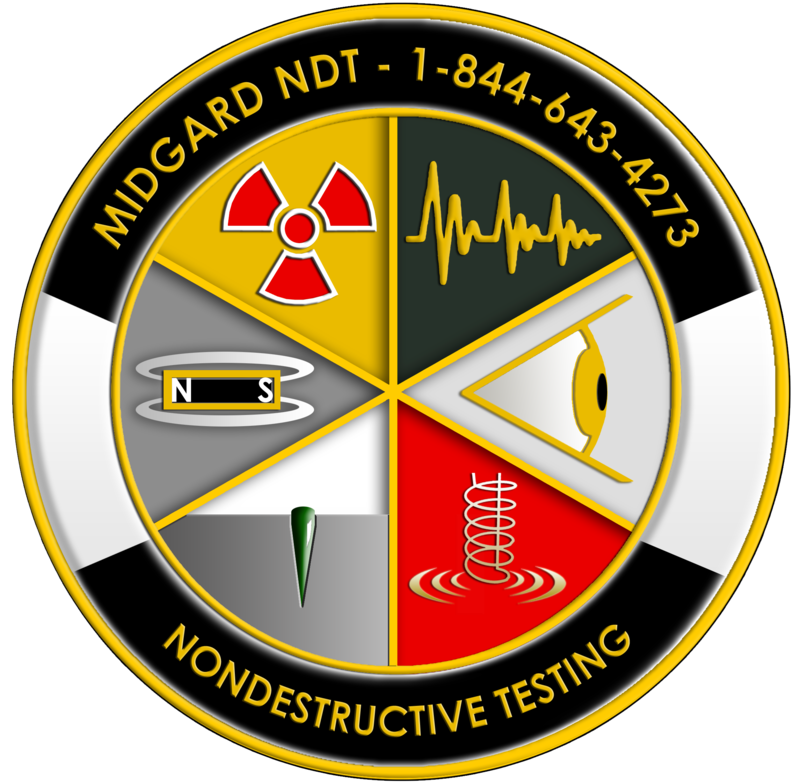 To learn more about NDT, call us at 1-844-643-4273 (1-844-MIDGARD) or visit our website at www.midgardscientific.com.